Bhagwati Pitambara Shaktipeeth at Datia town of Datia Dist. Madhya Pradesh, India. The Shaktipeeth was founded by Rashtra Guru Param Pujya Shri 1008 Shri Swamiji Maharaj Vanakhandeshwar Pujyapaad. Shri Vanakhandeshwar Maharaj was an expert of original Indian classical music. Number of famous musicians, vocalists and singers used to visit his ashram for music lesson. Guruji’s blessings Ustad Aadil Khan recovered his lost voice and he became a disciple of Shri Maharaj-ji. Maharaj-ji established and worshiped Bhagwati Pitambara Mata and hence the ashram was known as Pitambara Peeth. He used to tell his disciples to worship Shri Maa Bagalamukhi. Maharaj-ji also published a book, ‘Shri Bagalamukhi Rahasyam’ that contain every detail about Shri Maa Bagalamukhi. The method of tantrik veneration of Shri Maa Bagalamukhi, founded by Maharaj-ji, still continues to date. As Shri Maharaj-ji uttered that if the veneration shall continue like this then Maa Pitambara shall reside here making her permanent abode and she will keep blessing her followers. maa ki kripa turant milti hai.i was fortunate that i could visit the temple. maharaj ji ka tej hamesha exist rahata hai. You have written, “The method of tantrik veneration of Shri Maa Bagalamukhi, founded by Maharaj-ji, still continues to date.” I wish it was true. Unfortunately, all temples in Madhya Pradesh are suffering a serious assault from Vaishnavites who are using their clout in the RSS-BJP state government to takeover Shaiva and Shaakta shrines in Madhya Pradesh. During my last visit to the temple, earlier this month, I was shocked to find a shop selling janeoos had been established in the covered courtyard between Vankhandeshwar ji maharaj’s linga room and the open central courtyard! Wonder how Swamiji Maharaj would have reacted to this? In this context, I must also narrate a recent experience at Ujjain’s famed Mahakaaleshwar Temple: the semi-literate RSS sponsored purohit insisted on reading a Vishnu aadhaarit sankalp stating that sab kuch Vishnumay ho gaya hai. Wonder whether it was the right thing to be doing at Mahakaal? Such age old planned conspiritorial transgressions by the mealy mouthed brahman class (cursed by Nandi to never understand the Vedas since they had dared to insult Lord Siva who was himself the the embodiment of Vedic knowledge) have been the cause of loss of much knowledge about Shaakta and Shaiva puja paddhati. All my troubles got removed after I visited Mata Baglamukhi Devi. My Home town is in datia and From my childhood i am living in Datia. I have done my schooling from RLPS Datia that is located beside Maa Pitambara Temple. I only suggest peoples of this country that whenever u get the time plz visit Datia and Take the blessings of Maa Pitambara and Maa Dhumavati … Both temples are in Datia. Near Datia there are so many temples like Jain Temple (sonagir) It is 15 Km from Datia station. Only two or three trains stopped there so better to choose road to travel to this temple. .
Peetambara Peeth is till date of Sidh Peeth meant for removal of negative energies and give blessing to win over enemies who are unnecessary creating trouble for a native. Visit with full devotion Maa ki kirpa definately will be extended on you. Donot go for checking of power. Think in mind that you will get solution only from Maa, definately you will get solution to your problem. Jai mai ki.if any one want to go for darshan train will be best option.find a direct train to datia from ur home town,if there is no any direct train then go jhansi and there r so many express n passanger trains.distance from jhansi tn datia is only 29 km. 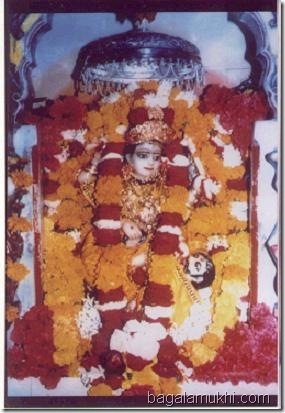 main mata ke darshan karna chahti hu. i want to visit the temple. please tell me the timings of temple? Can i get pooja and jaap at mata mandir at dalia. What is the procedure and cost. Can anyone tell me if the temple is open at any specific time during the year or we can visit throughout the year ? 1.please inform to route map of datia from gwalior. 3.Brief details of temple timings and details of puja and expenses or entry fees. Kindly inform me the timings and days of the temple when one should visit for darshan of Ma.